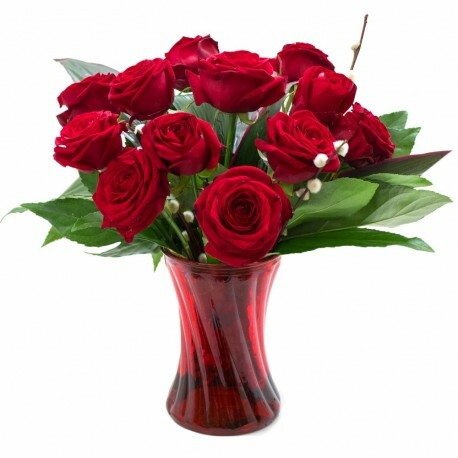 Twelve beautiful red roses arranged in a glass vase arrangement perfect gift for Valentines Day. This stunning arrangement is made using glorious long stem red roses and a mix of gorgeous glossy foliage’s to make this vase arrangement really stand out. Sent in water to keep these truly spectacular red roses fresh and hydrated. Why not add chocolates or a balloon or both to your order to really up the wow factor. Send it to their work or their home address and deliver a special surprise. They will surely be your valentine after receiving this! Butterflies and Blooms florists have over 18 years of experience and we strive to provide the freshest flowers in the designs and style our customers want. We deliver throughout Gateshead and Newcastle. Check out our Facebook page for a variety of photos of our work. Contact us with any queries.